The laptop will be available with Intel Core i3/i5/i7 variants with different RAM and storage configurations. Acer India has finally launched the Spin 3 convertible laptop in India, with prices starting from Rs. 42,999. The device was first announced back in IFA 2016, alongside many other Acer laptops. The Acer Spin 3 is a multipurpose laptop that can be used for both work and multimedia purposes. The main USP of this laptop is its hinge, which helps the display rotate all the way back by 360 degrees. This also makes it easier to use the 10-point multitouch display on the machine, which has a proprietary 'colour intelligence software'. The company claims that this software dynamically adjusts gamma and saturation in real-time, optimising screen colours and brightness. The display also has a BlueLightShield, which protects your eyes from harmful screen emissions. 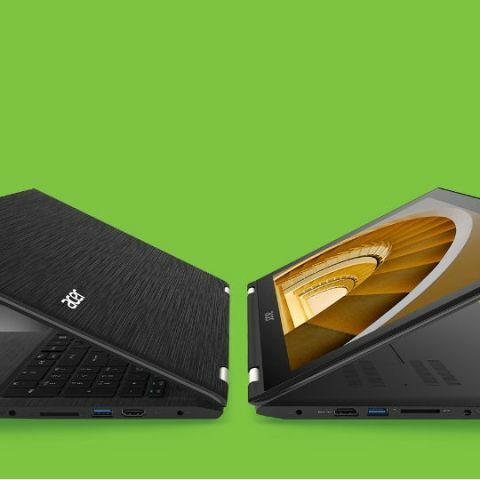 The laptop has a 15.6-inch HD display and multiple CPU, RAM and storage configurations. You can opt between Intel Core i3, i5 and i7 processors, from 6th/7th gen lineups. RAM and storage configurations start with 4GB DDR4, 500GB HDD and go up to 12GB DDR4, 1TB HDD with SSD storage. It is powered by a 4-cell battery that claims to provide nine hours of battery life. All SKUs come with Windows 10 pre-installed. Acer has employed a backlit chiclet keyboard with 1.6mm travel, and a glass touchpad. The laptop is also equipped with Dolby Audio Premium and Acer TrueHarmony software. Once launched, the Acer Spin 3 will be going up against the likes of Lenovo's Yoga lineup, HP’s Pavilion X360 range and Asus’ Zenbook Flip.